It’s well known among K-12 budget analysts—not to mention school district finance staff—that the vast majority of spending in education occurs on people. Recently released federal data provide clarity on what’s generally known about the huge amount of money in districts that’s consumed by the salaries and benefits of teachers, administrators, and support staff. The data also offer a general breakdown of how districts spend money in different areas connected to administration, student support, and instruction. Total spending in the United States’ K-12 system stands at $634 billion, or $11,222 per student for the 2013-14 year, the most recent year where data is available, according to the Condition of Education 2017 report, published by the National Center for Education Statistics. 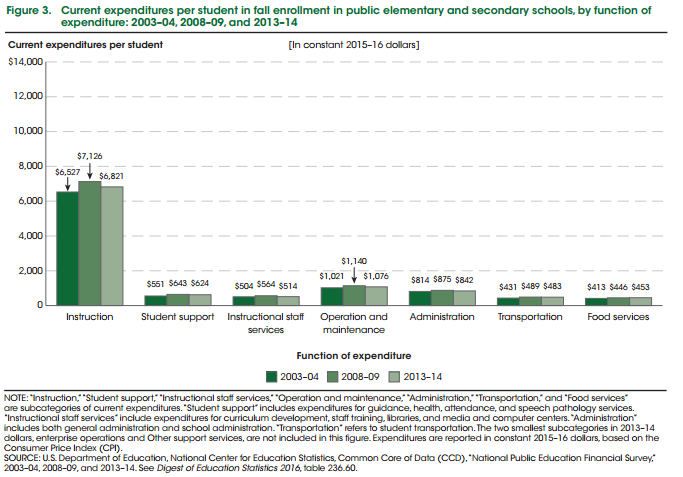 The remainder, as the chart shows, is being spent on purchased services, at 11 percent, a category that includes everything from professional development for teachers to contracts for transportation, food, and janitorial services. The buying of supplies, which NCES says covers everything from textbooks to heating oil, consumes 8 percent of district budgets. Per-student spending hit its highest point in 2008-09 at $11,699, and then fell every year until 2012-13, when it stabilized and grew slightly, as the economy began to climb out of the financial hole left by the Great Recession. 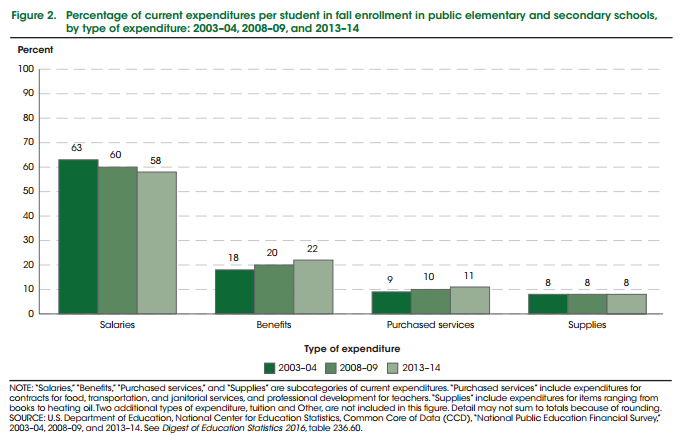 NCES also breaks down school spending by specific categories within the overall costs of salaries, benefits, purchased services, and supplies. The biggest individual spending category by far is “instruction,” at $6,821 per student annually—or 61 percent of all current spending. Spending on instruction includes not only salaries and benefits for teachers and aides, notes the agency, but also instructional materials and services that school officials contract to purchase. The money spent on curriculum is counted in the “instruction” category if it’s purchased curriculum, NCES explained in an email. But curriculum would be counted in another category, “instructional staff services,” funded at $514 per student, if it’s part of support given to staff who are developing lessons, the statistical agency says. Instructional staff services also includes staff training, and support for libraries and media and computer centers. Getting a precise gauge on district spending in another category, technology, is difficult, because that spending is counted across different categories. There’s nothing especially surprising about the amount districts spend on salaries and benefits—after all, teaching is at the core of the work that K-12 districts do—and people are the ones doing it every day in classrooms. But the data are a reminder of the constraints that districts face, in terms of the money available for curriculum, technology, and other needs, that are not already committed to paying personnel costs. It is interesting to know where the money is going. Alone salaries and benefits adding to 80 percent of school spending. Nice insight, Sean! Why do you lump all salaries together? Administration, support staff and teachers should be separated into their own groups.